Pretty In Pink Dogs: Guess who we can see some eyes opening first!!! Guess who we can see some eyes opening first!!! 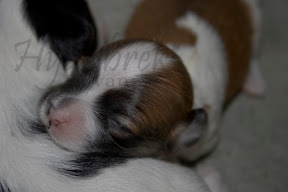 Guess who is starting to open his eyes first before any other puppies. The puppy we nicknamed "Zeus*" seems to be the first one we can see some eyes opening up. They are just mere slits right now, but slits in both eyes. Come one, slits counts. They might be fully open by tomorrow! Very exciting. Slits count! Slits count! Go Zeus!